During the Easter holidays the boys and I were invited over to Salford Museum and Art Gallery, an attraction that is totally free to the public. Despite having visited Manchester several times and enjoying nothing more than a free day out and educational places we hadn’t even heard of the Salford museum and Art Gallery, let alone visited and if I am to be totally honest I think I would have avoided it as the inclusion of Art Gallery in the title makes me think it less of a family friendly hands on museum and more of posh, quiet, artsy farty museum for the older, wealthier clientele and a place I wouldn’t be able to relax with my kids. When we arrived we were given a map and told what was where and the kids were also given an interactive worksheet to complete whilst going round, which I always think is a good idea as it keep them busy when you’re reading all the information, again this sheet is free for everyone so if your aren’t offered one just ask at reception. We headed down stairs first to the Victorian street, Lark Hill Place. This was most definitely the highlight of our visit and well worth a trip if you have children under 10. Lark Hill Place is the finest recreated Victorian Street of its kind, with authentic period shops and rooms all set out on a cobbled street. 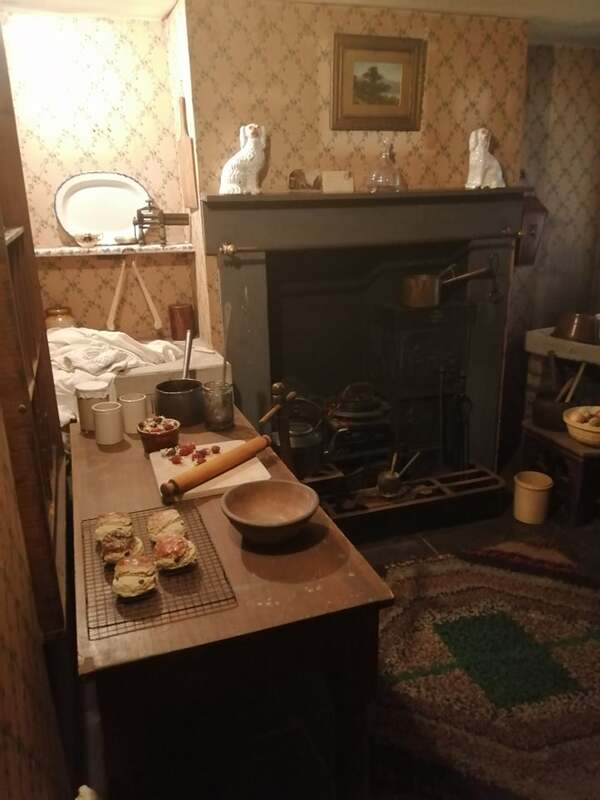 You can peer through the windows and see how the shops and houses would have been set up, it feel so realistic, like you have literally been transported back in time. 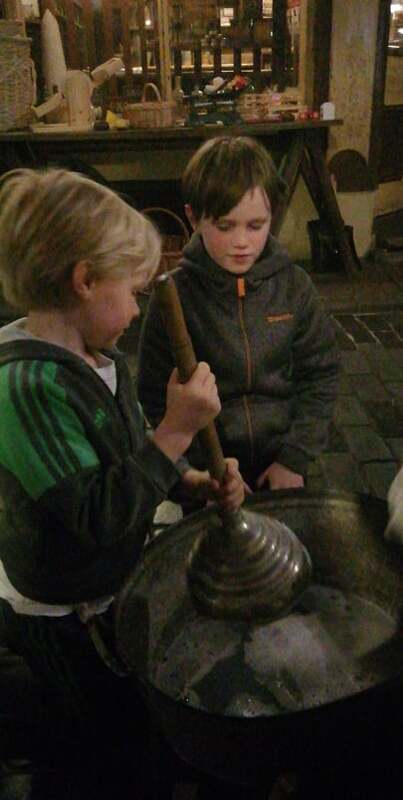 What made it even more incredible for us was that there was a young lady dressed in traditional Victorian clothes washing clothes on the street and the boys got the chance to try their hand at washing some socks the old fashioned way, everything from grating the soap to using a plunger, it was a real eye opener for them to realise that washing machines haven’t always existed. At the entrance to Lark Hill Place is a dressing up station full of Victorian clothing that the kids (and adults) can try on if they wish as well as a few interactive activity cards. We chose to do these after we had explored the street ourselves which I think was the best way to do it as when it asked them to find certain places they had a better idea as to where they were going and what they were looking for. The activities are a great way to embed a bit of extra learning to the day in a fun way too. For example one card asked us to create a window display which meant the boys have to use the props available to them and really think about how they would position them but they are also found some old fashioned weighing scales here and had fun weighing the various items and working out what weighed the most and what weighed the least. Once we had completely exhausted Lark Hill Place we made our sway up the stairs to the Art Gallery. Now this is an Art Gallery as you would imagine with lots of beautiful pieces on the wall however there were lots of children looking around too and I certainly didn’t feel on edge. What was also great was that in the middle of the room was a box of hats which a sign asking the kids to put on a hat and then find it in one of the paintings. This definitely made the boys look at the paintings more closely and gave me the chance to have a look round too without worrying if they were getting bored. From here we went into the A-Z Exhibit which is full of weird and wonderful things. The kids and I made a point of going from A-Z, reading what was there and trying to find everything and we all found it really interesting if it not a little bizarre in places. 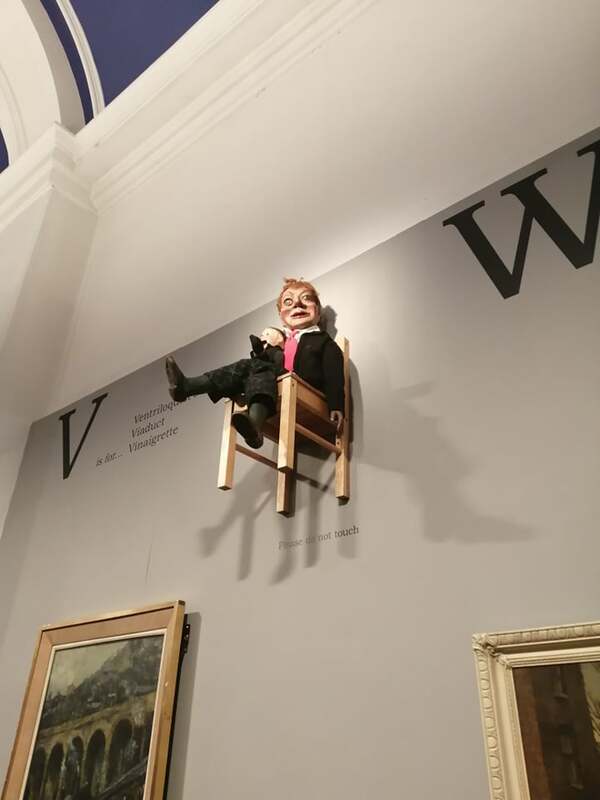 Overall the Salford museum and Art Gallery is definitely a family friendly fun and educational day out with numerous interactive stations and craft tables set up to encourage the little ones to join in. It probably takes about 1.5 hours, maybe a little longer if you have smaller children that want to do all the activities and if you are in the area or can combine it with a visit to somewhere else nearby like Ordall Hall then it is worth a visit. 1.Make sure you have change for parking as it is pay and display. It is also worth having a look at local parking as the car park is not very big, although we did manage to get a space. 2. If you want to make sure this is a totally free day out then you could either go for the morning or afternoon as half a day is plenty or take a pic nic because there is a lovely park just behind the museum where you could enjoy your lunch if the sun is shining. Failing that the cafe was lovely (especially the soup) and reasonably priced. 3. Take a camera/phone you will definitely want to take pictures in Lark Hill Place. 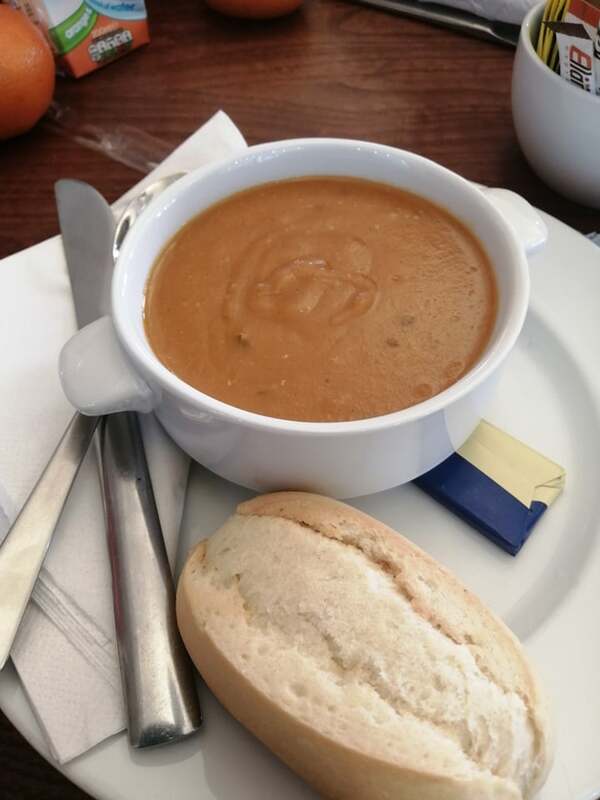 (We were given complimentary parking and lunch in exchange for an honest review. All opinions are my own).